We’ll learn how we can block traffic originated from specific country IPs using GeoIP database and linux iptables. Iptables is a command based utility program for configuring the linux kernel firewall which is implemented within the Netfilter project. Whereas GeoIP is a collection of IPs corresponding with the geographical locations where the geographical location is mapped with the IP addresses allocated at those specific organization, city, state and countries. The geographical co-ordinates in the GeoIP database are the often near the center of the population so it should not be used to identify a particular address or household. And with the help of a module called xt_geoip consisting in an iptables extension xtables-addon and the GeoIP database, we’ll perform country-based traffic filtering which helps us block or allow the traffic from a specific country. In the previous post, we’ve talked about how to Secure Linux Server Using Hardening Best Practices and some people ask me about firewall section which was a brief introduction about iptables firewall. Today we will discuss in detail the Linux iptables firewall and how to secure our servers traffic using that awesome tool. Today we will walk through iptables and firewalld and we will learn about the history of these two along with installation & how we can configure these for our Linux distributions. In this article, we will show you some 25 useful iptable firewall rules that will help you to manage and control you Linux firewall through iptables easily. Today, we will come to know how we can install and configure arno iptables on Ubuntu 14.04 LTS. This is related to security hardening of your server. A good System Administrator must secure his Linux driven servers. There are many ways we can secure our servers. Setting up a good solid firewall is an essential step to take in securing any modern operating system according to your needs. I will show you how to install & Configure arno iptables On Ubuntu 14.04 LTS for securing your servers. One problem that some VoIP users are experiencing these days is that they have trouble connecting to their home Asterisk, FreeSWITCH, YATE, or other software PBX server, but only when using certain ISP’s. One suspicion is that certain ISP’s that offer their own VoIP or traditional landline service attempt to mess with packets using the common SIP port 5060, hoping customers will think that VoIP is unreliable and will subscribe to the company’s overpriced offering instead (see this thread at BroadbandReports.com). Now you should see this page. The items you need to change are indicated by the red ovals. The Destination TCP or UDP port is set to 7654 in this example, but don’t use that. Pick your own unique port; just make sure that it’s not used by anything else on the server already. And yes, you really do put the alternate SIP port you want to use in the Destination setting; it may not make intuitive sense but that’s just how it is. Avoid using ports in the range 10000 through 20000 because those are used for RTP traffic, and avoid ports below 1024 because those are protected ports that are reserved by the system. There are also other ports you should avoid (those used by other software on your system) but if you don’t know how to find ports in use on your system, a bit of time with a search engine will lead you to several pages that show you how to detect already active ports. It can vary a bit depending on your operating system, and it’s beyond the scope of this article. SIP traffic is UDP only, not TCP (there may be rare exceptions but most software PBX’s use UDP by default). If by some very odd chance you are using TCP for SIP traffic (why?!?) then you will need to specify that under the Network Protocol item. Also, note that the incoming interface is set to eth0 in this example – Webmin will usually show the correct one by default, but you want to select the interface used by incoming SIP traffic if you happen to have more than one. Don’t forget to click Save when you’re finished. 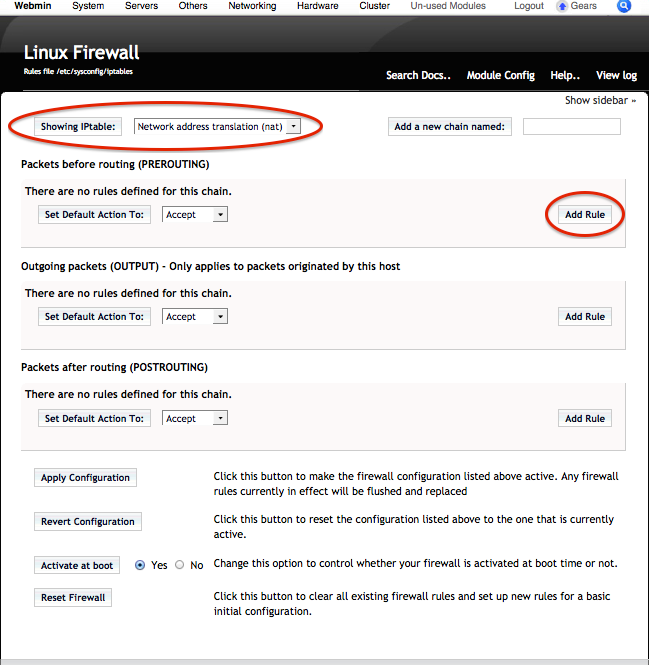 One other thing you might need to to is add a rule on the main Linux Firewall page allowing incoming traffic on your selected alternate port, if you have a restrictive firewall that blocks most traffic by default. Try it first without doing that, but if your clients can’t connect on the alternate port, just be aware that you may need to do that before they will be able to connect. For more security, you can enable access to your SIP ports only from specific IP addresses, if your remote clients are at fixed IP addresses. 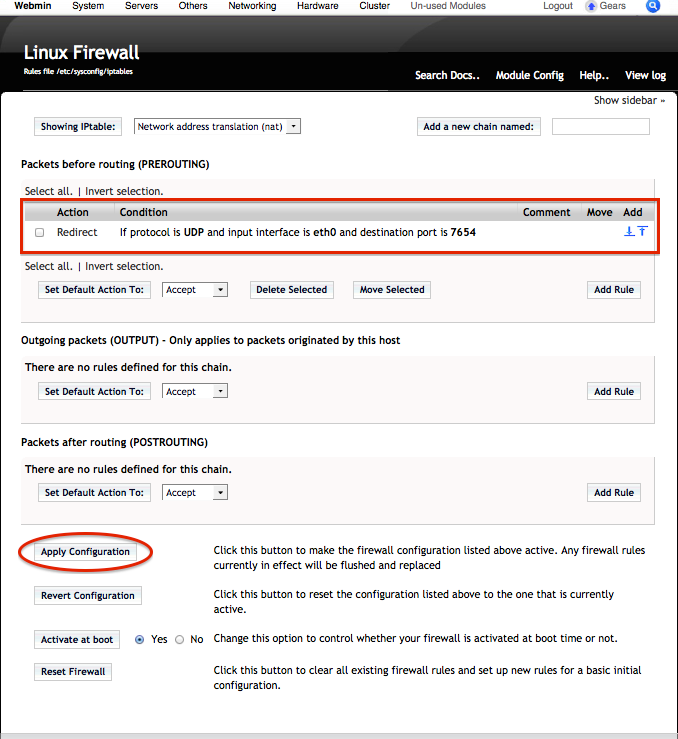 Now you should be able to change the port number on your SIP endpoints from the default 5060 to your alternate port. Of course I can’t guarantee it will always work, but if you try it and suddenly find that your SIP connections become far more reliable, you might want to leave a comment, and mention the ISP that you suspect might be messing with SIP traffic. Iptable is the administration tool for IPv4 packet filtering and NAT. Iptables is used to set up, maintain, and inspect the tables of IPv4 packet filter rules in the Linux kernel. Several different tables may be defined.Each table contains a number of built-in chains and may also contain user-defined chains.Each chain is a list of rules which can match a set of packets. Each rule specifies what to do with a packet that matches. This is called a `target’,which may be a jump to a user-defined chain in the same table. In this tutorial, I’ll explain how to share a single Internet connection among multiple devices on Linux. While consumer-grade WiFi routers have become mainstream nowadays, making this problem a non-issue, suppose you don’t have one at home. However, say you have a Linux box already assembled with a modem and a LAN card. The modem is connected to the Internet with a dynamic public IP address, and the LAN card connected to your switch/hub. Other devices (Linux/Windows PC, laptop) are connected to the switch without having any Internet connection. To share the Internet connection of the Linux box, you have to turn the box into a gateway, so that it can relay traffic to and from other devices.